One month after Peter was born, his grandparents noticed that he only looked to his left side. We noticed the same, but did not give it much more thought, assuming that his little newborn head did not have much control. Over the next 6 weeks it became very clear that Peter would never turn his head to the right side. Peter received his STARband at 4 ½ months. We had the band painted for decoration – considering it would become an essential part of his wardrobe for the next few months! We enjoyed visiting Tony every three weeks for adjustments to the band, and saw incredible adjustment to his head after the first 2 weeks! 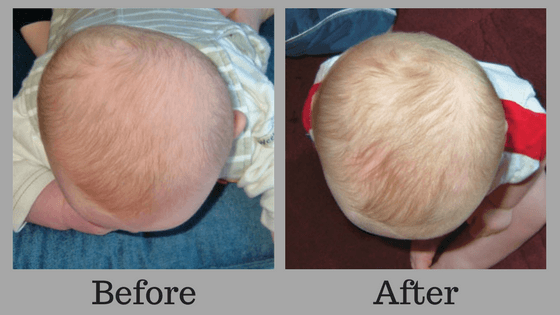 It was amazing to see how correctable plagiocephaly can be with a cranial band! Peter will be a STARband graduate on June 23, 2005 – much sooner than originally expected. In addition, his biweekly physical therapy appointments and exercises have fully corrected his torticollis, aiding in the correction of his head. He did not mind wearing his STARband and during this treatment process, we have had many opportunities to explain to others about torticollis, plagiocephaly, cranial bands and our very positive experience overall. Peter’s head has become beautifully oval and we are thrilled with the results. We would definitely recommend a cranial remolding orthosis for any family in a similar situation. Thank you for making such a fantastic product!